As you can see in the examples above, the start character * is used as a placeholder for the arbitrary characters that may be present in the file name. You can also review and adjust the search options, displayed in the middle portion of the Find Files window, such as the files to exclude from seach, include or exclude subfolders from the search, etc. To begin the search, press the Start Search button on the Find Files window and AB Commander will examine each file name in turn, trying to determine whether the file name matches the mask you specified. If it finds the match, it adds it to the search results, in the same window. 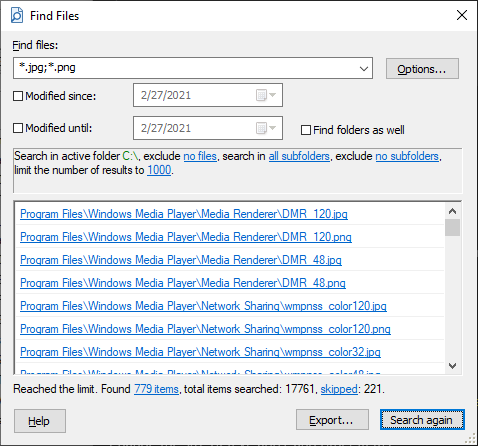 Each search result displayed in the Find Files window contains the path of the file found, relative to the folder from which you started the search. If you click on the file name, AB Commander will navigate to that file in its active panel. Note that unlike the Quick Find command that searches for text in the selected files and folders, the Find Files command searches in all files and folders present in the active panel, without regard to whether they are selected or not. Note also that if you specify the exclude files mask as well, then the files matching the exclude mask will be excluded from the search even if they match the Find Files mask.